The sharpness of the cheese in this dish offsets the figs beautifully, while the strong, salty Serrano ham gives a Spanish flavour. Put the olive oil in a frying pan and warm over a low heat. Add the onions and cook, covered, for 15–20 minutes, stirring occasionally, until they are golden brown. Remove from the heat and set aside. Cut the stems off the figs and slice in half lengthwise. Place them on a baking tray cut-side up and place under a hot grill for 2–4 minutes – just long enough to brown the figs a little and warm them through. 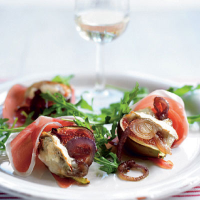 Remove from the grill and cover the figs with the onion, then top with slivers of goat’s cheese. Put back under the grill for a further 2–4 minutes, until the cheese is bubbling and just turning golden. To serve, divide the Serrano ham, rocket leaves and fig halves between the plates.